Filmmaking duo, Joel and Ethan Coen have been captivating audiences since their profound, neo-noir debut, Blood Simple. Their fan base is so large due to, in part, their unique ability to create engrossing films from wildly different genres. They can be zany (Raising Arizona, O Brother Where Art There?) period-gangster (Miller's Crossing) cult classic (The Big Lebowski) and thrilling brilliant (Fargo) at the drop of a hat. It is hard to live up to the Coen hype. No Country for Old Men does it with ease. The brothers' latest venture into the unknown is a breathtaking spectacle of money, crime, passions and male dominance. The Coen's make a smart move by staying loyal to Cormac McCarthy's poetic novel, allowing the viewer to be taken on one hell of a wild ride through the warped minds of a pair of truly original filmmakers. 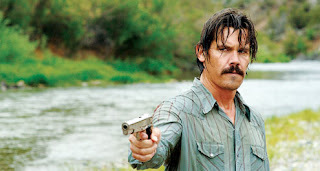 The intricate plot kicks off when regular guy Llewelyn Moss (Josh Brolin) stumbles across the aftermath of a drug deal gone wrong in the deserted Texas desert. Using his Vietnam War instinct, he finds a satchel with over two million bucks in it. Soon enough Moss has a calculated, homicidal maniac (Javier Bardem) after him and the local sheriff (Tommy Lee Jones) looking for them both. There's the first ten minutes, and that's all you're going to get because it’d be a sin to ruin anymore of this flawless film. The attention to detail resonates in every single frame of the picture. From the clanking sound of a crappy, hotel room fan, to boot scuffs on the ground, the Coen's play off of McCarthy's keen eye for detail. Josh Brolin has done it all this year. He’s contributed scene-stealing roles in Grindhouse, In the Valley of Elah and American Gangster. His performance in No Country for Old Men is the best work he has ever done, not to mention some of the best in all of 2007. He gives Moss a sick desperation to live a better life, dwelling deep in the spoils of greed at the expense of losing everything. From the first moment you meet Anton Chigurh, you will not be able to shake him. Javier Bardem's stone cold, bloodshot eyes will haunt your dreams. You’ll forget there’s a handsome, Spanish, Oscar nominated actor behind that incredibly disturbing face. Going beyond serial killer stereotype’s, Bardem invests his credible acting into a man so morally corrupt, he will engage in lengthy, eloquent conversations before blowing your head off. A scene at a gas station is the single greatest exchange of dialogue from a movie this year. With the fate of an innocent clerk decided by a coin toss, you’ll feel bad for smiling at the way Bardem plays it. Twenty years from now, people will be talking about this performance. Anton Chigurh is matched with Hannibal Lecter and Norman Bates as one of the greatest movie villains of all time. Tommy Lee Jones, so good earlier this year in The Valley of Elah, contributes his familiar, Southern drawl as a small town sheriff, trying to make sense of madness. Often funny, his Ed Tom Bell is a man sick of the world he has seen, wondering why God hasn't entered his life. Look for a two-time Oscar contender. Supporting turns from Kelly Macdonald (as Moss's fragile wife) and Woody Harrelson (has he been better?) affirm the film's genuine intrigue. Once again, cinematographer Roger Deakins (see reviews of In Valley of Elah, and Assassination of Jesse James) stuns us with shadows and landscapes. I cannot think of a better eye for gritty detail. Whether it's establishing shots of an isolated desert, or the reflection of a gun in an empty key hole, Deakins (a Coen vet) presents some of his finest work. His hat-trick of 2007 is now wonderfully complete. It took me longer than usual to write my review of this film, for two reasons. I wanted a second viewing and I wanted to finish the book. As a culture that is spoon-fed its entertainment, be aware that No Country for Old Men divulges itself at being different. You’ll think there are plot holes. There aren’t. You’ll begin an endless game of who’s and how’s and why’s that you won’t be able to win. The film will inspire weeks of dinner-table discussions. Reasons and motivations (and actions) do not need to be disclosed in order to make a compelling film. I can only offer a bit of advice, and that is to listen. I'll never tell just what to look out for, but after my first viewing, I wished that I had listened more carefully to the beautiful exchanges in dialogue. Much of it taken directly from McCarthy’s metaphorical words, it is essential to contribute your senses to the characters (namely in the third act) in order to walk away with some form of notable coherence. Startlingly violent, smart, witty, frequently humorous and wonderfully paced, No Country for Old Men is the best film the Coen’s have ever done and quite possibly, the best film of the year. Thanks for the advice to "listen." I've never been told to do that before viewing a film. I also enjoyed the information about the editor. I look forward to seeing the movie very soon. Good review. Oh my.....I was blown away by this movie. I have to see it again. I fear I missed something. Yes, this is the creepiest villian ever....only Charles Manson may be worse. I have some questions after my first viewing. Josh Brolin's character's wife stole the show in many ways. Good review, good movie.